Well, yesterday's Playstation Meeting 2013 has been and gone. I was rather disappointed by Sony's constant references to 'world' gaming, as there were barely any appearances from overseas creators at all. And no women. The monoculture evident in the presentation will likely appeal to the Xbox crowd, but I reservations about the variety of the initial offerings from what has been shown so far. It's likely that I'll buy a PS4 at some point and the list of third party companies was solid; it just sorely needs a must-have game to get me excited. This may not happen in the first wave of titles. Anyway, Capcom have formally announced the details of the Sengoku Basara Triple Pack for PS3 today and shown off the cover art for the first time. As previously reported on this blog, it will be released on 28th March 2013 and its price will be ¥6,990. 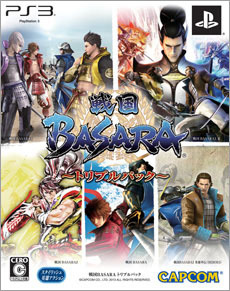 The pack will contain Sengoku Basara HD Collection, Sengoku Basara 3 and Sengoku Basara 3 Utage - that's every full Sengoku Basara game in the series - all in one pack. The spin-offs, which aren't available for PS3 at this time, aren't included. Evidence of preparation for next month's Basara Matsuri 2013 ~Haru No Jin~ is finally starting to appear. Capcom's special Sengoku Basara mobile newsletter Tokusei Kawaraban is running a questionnaire for members at the moment to pick warlords based on the theme 'Spring'. The website says that the survey results might affect Basara Matsuri. They'll probably just read the results out or (if they get good responses) use them in the cast discussions. I'm a sucker for feedback so I eagerly completed the form. The questions are sort of funny and all themed around traditional springtime hanami (cherry blossom viewing) parties, so I'll list a translation of them. Q2. Which warlord would you like to have for a teacher or boss? Q4. Which warlord would you like to have for a junior or subordinate? Q6. Which warlord would you like to have for a headmaster or company president? Q10. Which warlord would be a bad drunk? Q12. Which warlord is likely to go early in the morning to save a spot? There are gaps in my numbering because you have to support each answer with a good reason and give yourself an alias. Some of the roles were easy to pick characters for; I wonder what my fellow fans will choose?